Navutu Stars is a small Boutique Resort spreading along three bays in the Yasawa Islands, where it is possible to experience authentic Fiji in a comfortable, private and inspiring atmosphere. Envisioned and created by its Italian owners to escape the hectic and modern living, in favour of a south pacific barefoot paradise; Navutu Stars is a place where your mind and body can nourish themselves, to live your love, where excellent dining is a priority and where to enjoy one of the most stunning landscapes of the world, where the rhythm of life is not imposed by external factors, but purely by nature itself. On Yaqeta Island in the Yasawa Group. Navutu Stars’ guests are lodged in one of our nine individually crafted thatched roof bure, nestled along three bays, secluded in the lush tropical vegetation and swaying palms, creating a sense of unique privacy and an exclusive and timeless atmosphere. Beachfront Bures - are absolutely Beachfront spread along a bay of white sandy beach overlooking a Turqoise Lagoon and two lush neighbouring islands. Very spacious, open plan and full of light with their 70sqm of Mediterranean Interiors with immaculate whitewashed walls embellished by colourful Asian cushions and furniture, with a king-size bed and two built-in sofas, the Bure are topped by unique eight meters high Fijian Roofs, build by the local craftsmen with the sacred NokoNoko timbers. A full wall of French doors opens on the decked veranda, which boosts spectacular views of the bay, where you can enjoy a romantic meal steps away from the ocean or a nap on one of your Sunbeds or on your Hammock, under the Yaswan breeze or star filled sky. Each Bure is surrounded by a flourishing vegetation to protect your privacy and to create your own personal garden. Grand Bure - Similar in design to the Beachfront Bure and boosting an oversized soaking tub in the living area, that will be prepared by our masseuses with scented oils, dried flowers and floating candles, the Grand Bure are located on a smaller beach on the eastern side of Navutu. From the 80sqm Hill top decking of Bure 1 you will fill your eyes with the stunning view of the ocean, being able to see the furthest islands of the archipelago, or you will live the 120sqm garden of Bure 3 blossoming with Ibiscus and Frangipani, only steps away from the Beach. 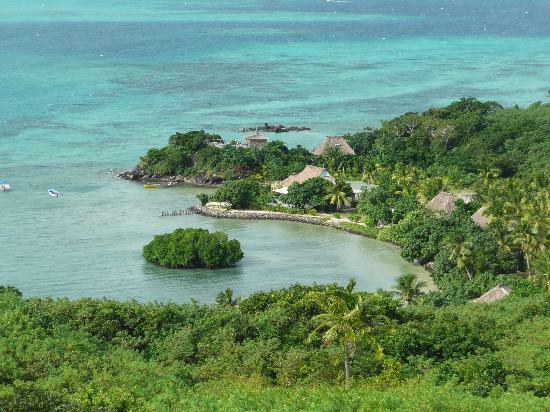 Garden Bure - Navutu Stars also offers a Garden Bure with Ocean view. With a similar design to the Beachfront Bure, it is located between the two Grand Bure and has access to the same beach. It is particularly suitable for those seeking a greater privacy and a more economical option. All Bure feature bathrooms with double stone vanities and shower, the finest of linens, and outdoor day beds where to indulge in lazy naps under the stars, cd player , wet bar and books. Daily changes of flowers and decorations for special celebrations are all part of Navutu Stars treat. Navutu Stars prides itself to offer world class gourmet dishes on a remote south pacific island, in a country renowned for its natural and human assests but not for food quality. Our local Head Chef, Ben, has been taught, throughout his years of kitchen experience, by European chefs, and with the owners and rest of the kitchen staff makes a point of having excellent dining as a priority. Our cuisine uses the best of the local ingredients mixed with traditionally Italian delicacies. Abundance of freshly–caught lobsters, crab or tunas and deliciously tender beef, together with freshly grown organic seasonal vegetables, will be always on your ever-changing menus. International telephone, Resort boutique & snack bar, Dive Centre, Restaurant, Bar, Hotel safe, Laundry. Navutu Stars has a Dive shop at the resort. Contact us direct for diving in the Yasawas. Transfer to the resort is via Yasawa Flyer which departs Port Denarau at 8.30am daily. One way cost per person is FJ$120.00 each way. © All rights Reserved. 2009-2013.